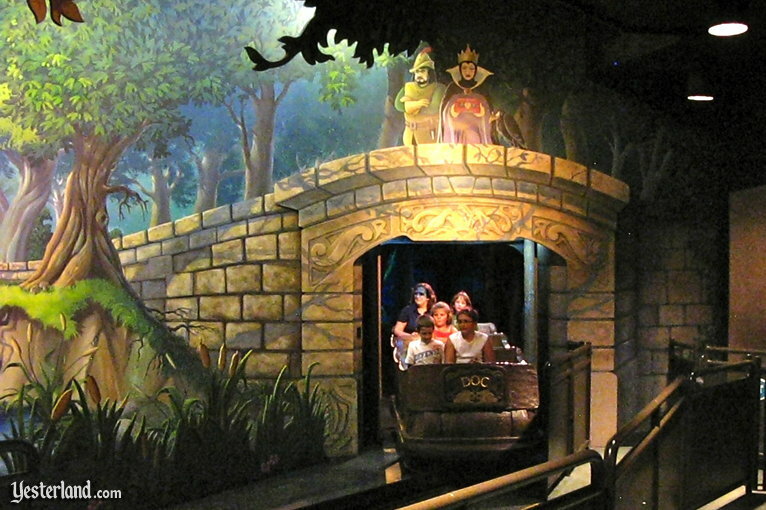 A classic movie inspired classic dark rides at Disney theme parks worldwide. 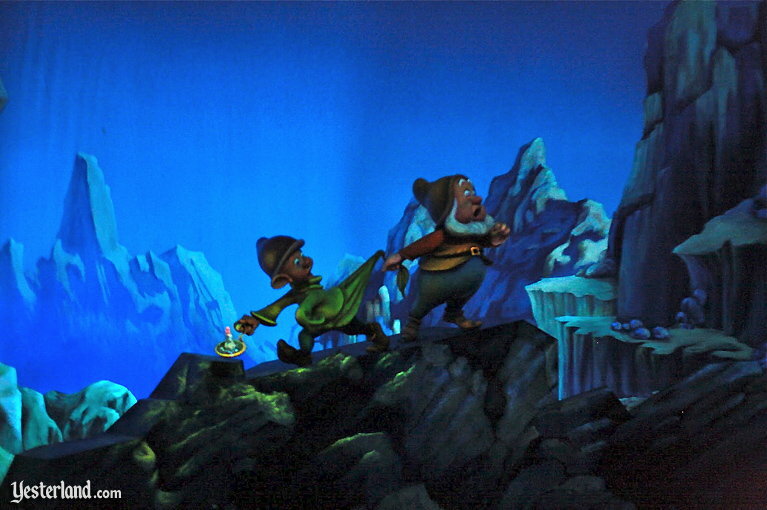 The movie is Walt Disney’s 1937 animated feature, Snow White and the Seven Dwarfs. 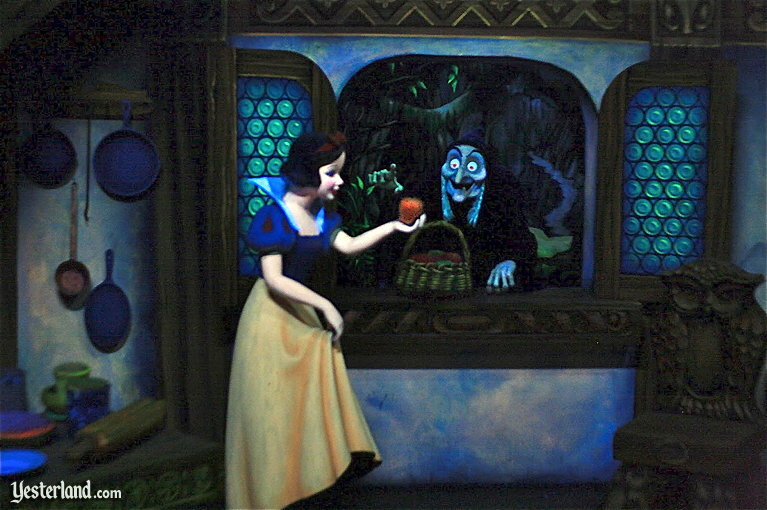 At the original Disneyland, the ride is Snow White’s Scary Adventures. 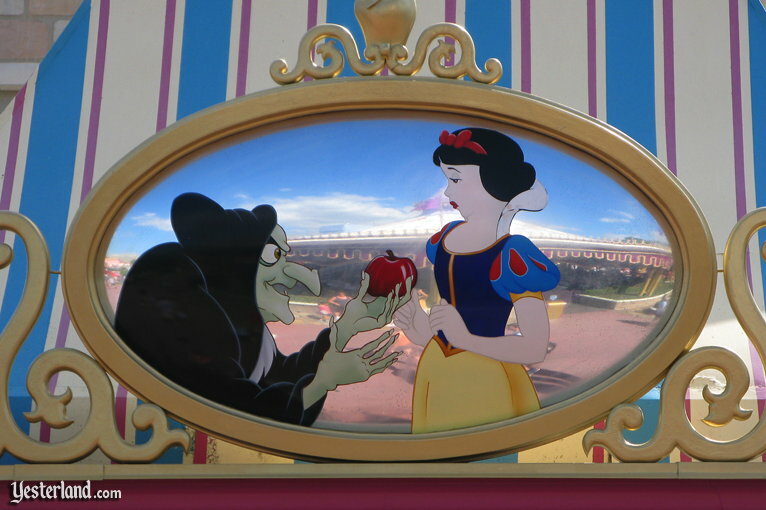 At Tokyo Disneyland, the ride is simply Snow White’s Adventures. 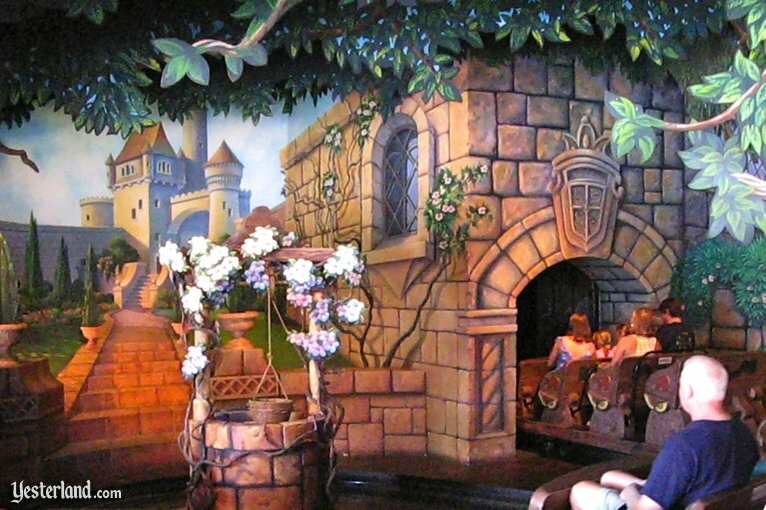 At Disneyland Paris, the ride is Blanche-Neige et les Sept Nains. At Magic Kingdom Park at Walt Disney World, the ride is gone. 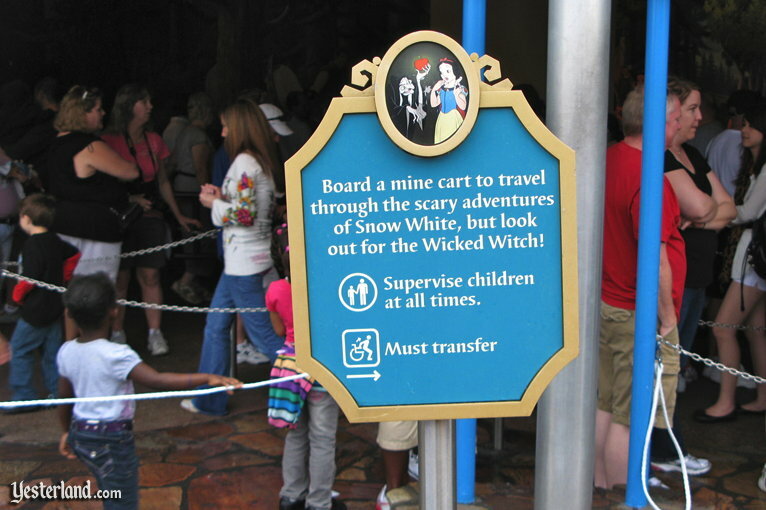 The Florida edition of Snow White’s Scary Adventures is part of Yester World. 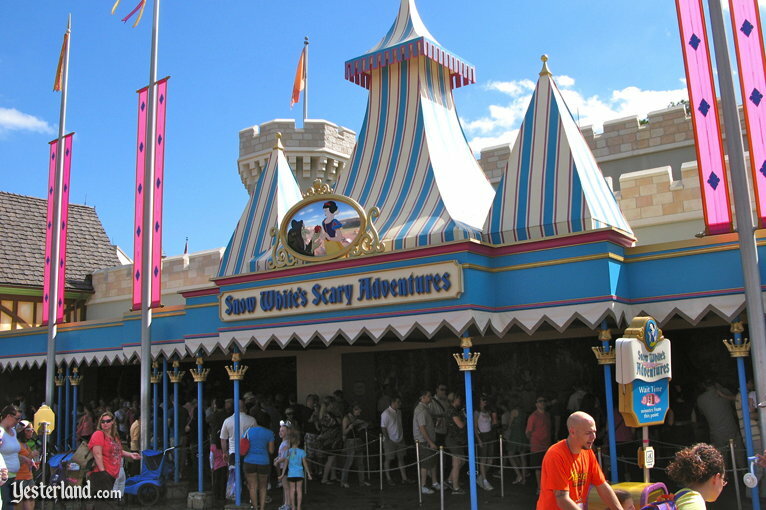 Snow White’s Adventures—without the adjective Scary in its name—was one of the Magic Kingdom’s original rides when the park opened October 1, 1971. 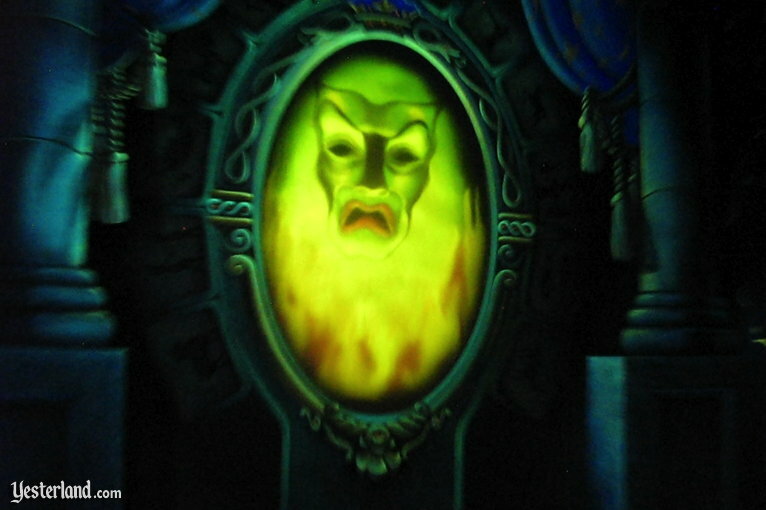 The original ride was scary—very scary—for young children. 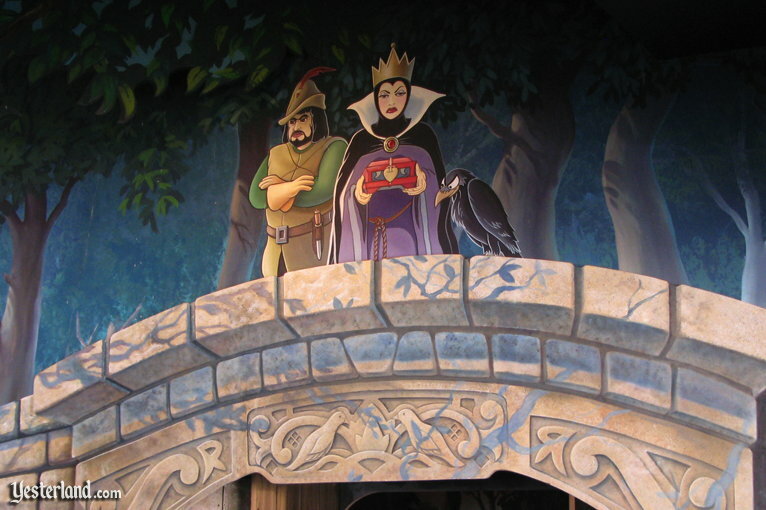 Snow White never appeared in the ride, but the Evil Queen appeared more than a half dozen times. The idea at the time was that you—the park guest—were Snow White being pursued in the darkness by the Evil Queen who had turned herself into a witch and was trying to kill you. 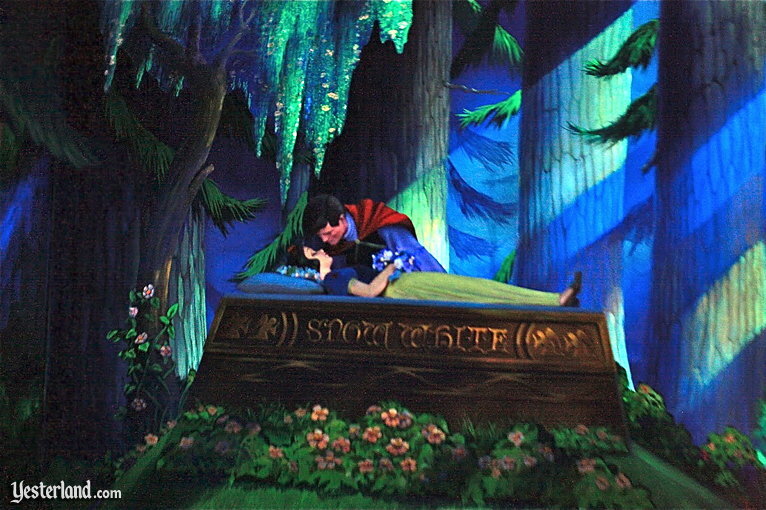 Snow White is never seen because the ride is designed to make guests feel as though they are Snow White experiencing the terrors that befall her in the movie—rushing through the dark forest, seeing the Evil Queen transform into a wicked old woman, being beckoned to eat a poisoned apple. 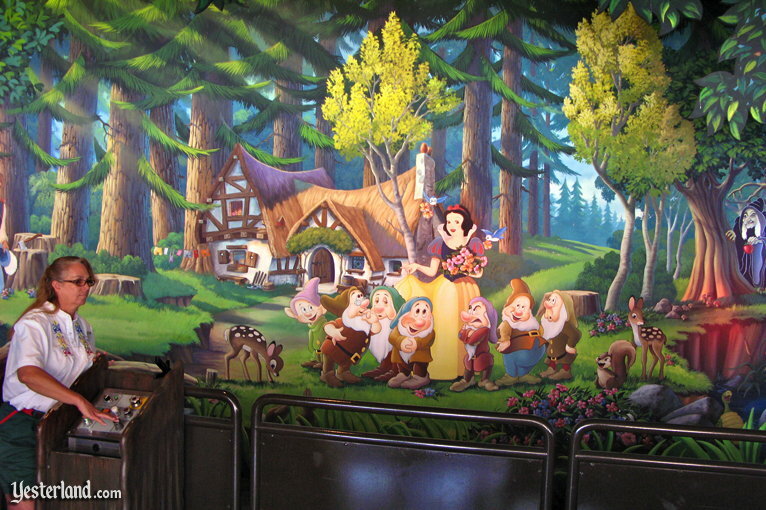 Not only does this Snow White ride not have a Snow White, there’s no sign of a prince, and the only time the movie’s lovable dwarfs are seen, they are scared out of their seven little minds. At the end of the ride, the witch was pushing a giant gemstone above your ride vehicle; almost immediately, you saw cartoon starbursts illuminated by strobe lights. Depending on how you interpreted that scene, you were either “seeing stars” from the impact on your head—or you were dead. 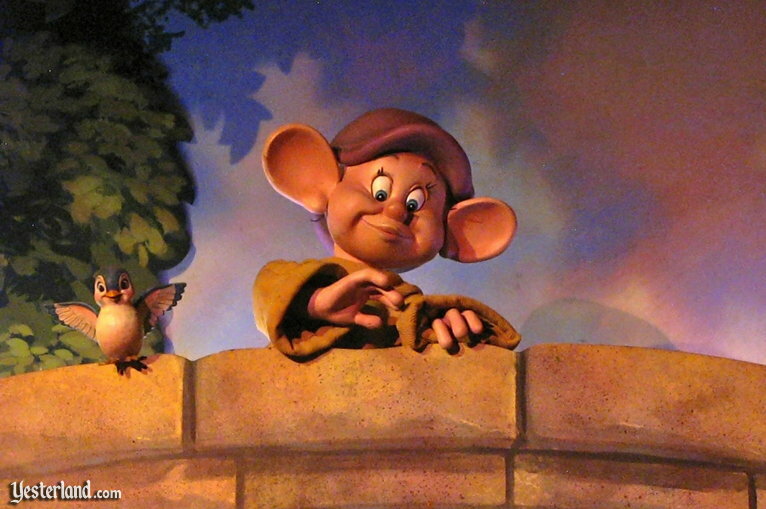 Although the California version of the ride had been made less scary as part of the 1983 New Fantasyland, the Florida version continued to terrify children until well into 1994. Then it closed for a multi-month makeover. 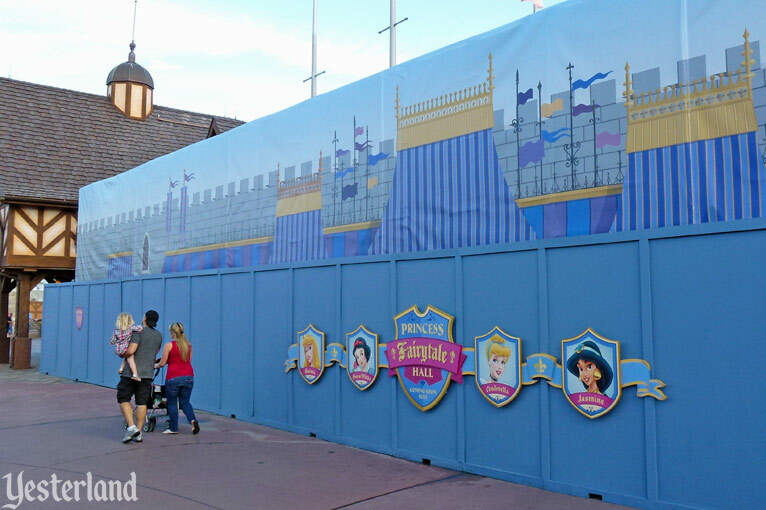 When the ride reopens Dec. 16, guests will board new six-passenger cars (instead of the old four-person cars) and see a mini-version of the movie. There will still be enough scary stuff to keep the warning sign out front, but it will be tempered by some of the endearing scenes that made the movie such a hit. 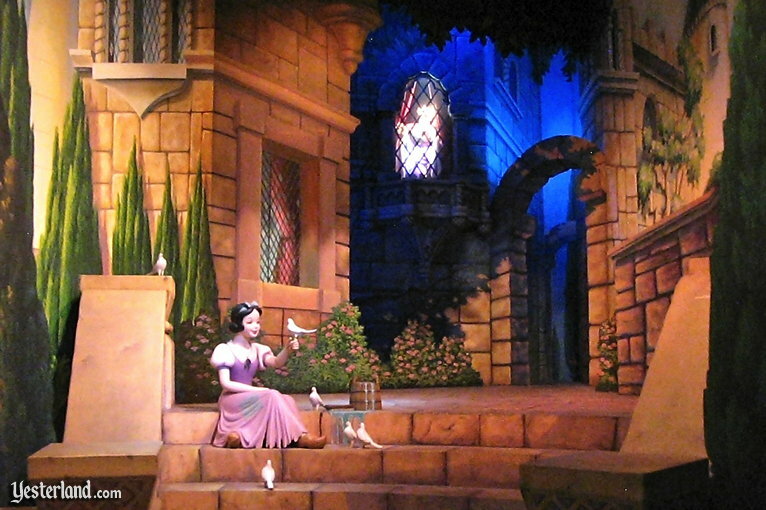 Snow White will appear at the well with the doves, dance with the dwarfs, and—unlike at any of the other Disney rides—get Love’s First Smooch by The Prince himself. 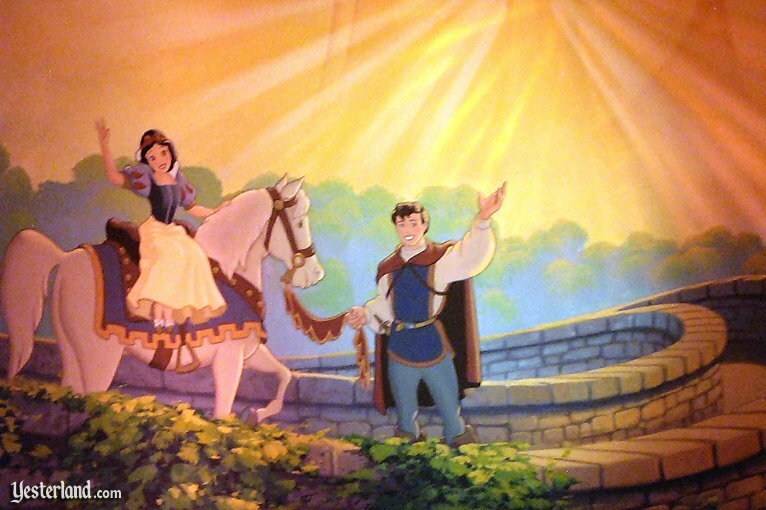 As guests leave, they’ll see Snow White and her royal significant other ride off in the distance, and Dopey will lean over a bridge to wave goodbye as they pass underneath. For more than 17 years, guests enjoyed the new version. 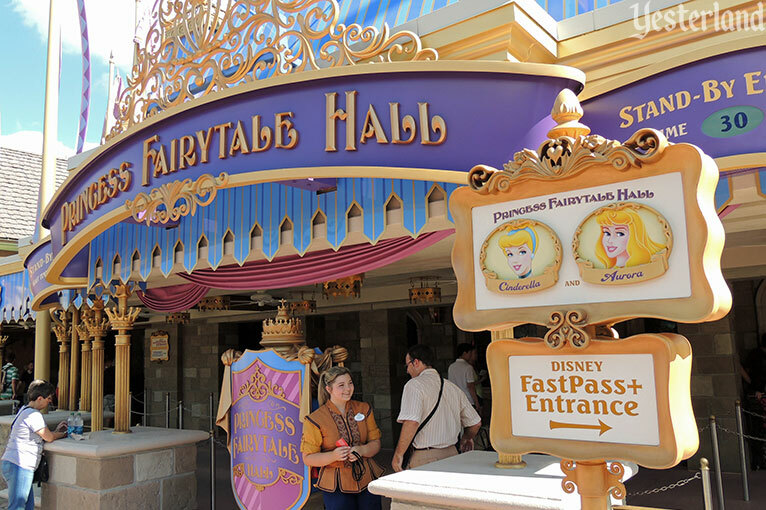 Princess Fairytale Hall opened September 18, 2013—more than 15 months after Snow White’s Scary Adventures closed. 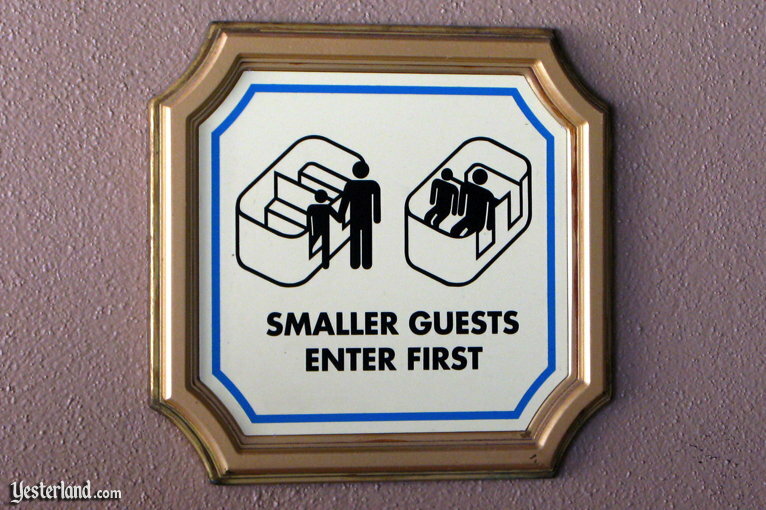 Replacing a classic dark ride with a “meet and greet” may seem like a step backward. 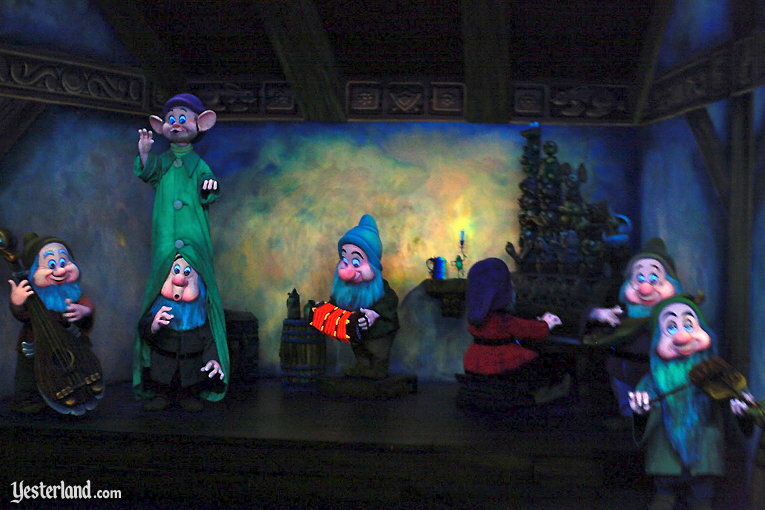 However, Snow White and the Seven Dwarfs inspired a new ride nearby. 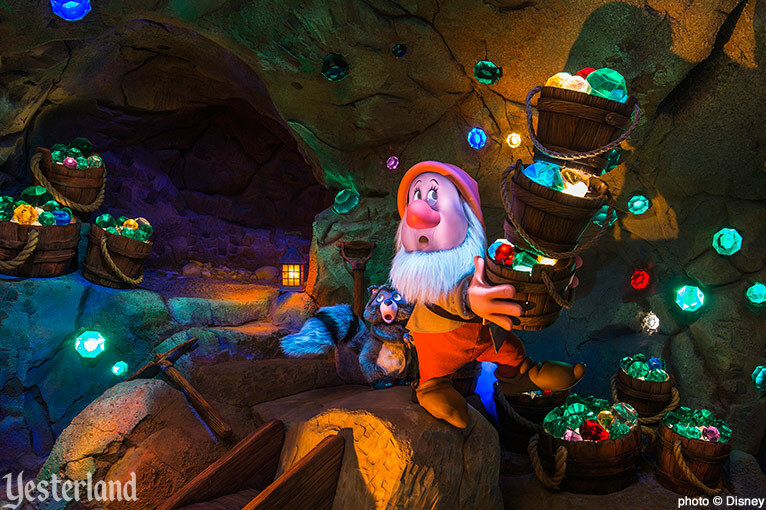 Seven Dwarfs Mine Train officially opened May 28, 2014. 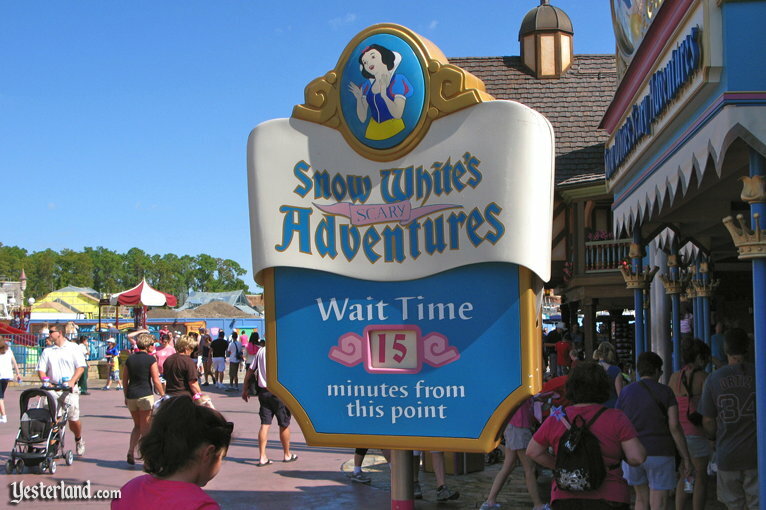 Magic Kingdom Park now has the best Snow White ride of any Disney theme park.